Last year, word hit that Kobe Bryant was sitting out just about every Los Angeles Lakers practice, mainly because his goofed-up right knee wasn't able to handle the day-to-day pounding matched with the expectations of having to play deep into June as the Lakers defended their back-to-back championships. Nothing wrong with that, we submit, as Kobe has been working himself to the bone and into the postseason since entering the league in 1996, with the lone exception of the frustrating 2004-05 campaign. So it makes complete sense that Bryant -- with no hope of his right leg sprouting a new knee and requisite ligaments after three rubs of a genie's lamp -- would take on some unorthodox techniques as he attempts to rehab and get back into those Finals. The Los Angeles Times reported on Thursday that Bryant has taken part in what they called "a derivation of platelet-rich plasma therapy." The idea behind the whole unorthodox routine relies on a physician taking a plasma sample from Kobe, running it 'round a centrifuge until the platelets are isolated, and then watching as a doctor injects what's left from his blood sample back into what hurts the worst. "The interesting part is that it's not super complicated," [Stanford Orthopedic surgeon Allan Mishra] said. "It's really only your own blood taken out of a vein and prepared right in front of you and then put back in an area of your condition. So the concept is to try and use within your own body to help heal yourself. This is an opportunity to really take advantage of the body's own natural ability." Mishra went on to conclude that "the data is immature" behind this sort of platelet invasion -- it has yet to settle itself with a cadre of significant results. And we should point out that previous NBA participants like Portland's Brandon Roy and Wesley Matthews have yet to show any significant recovery bounces from their willingness to undergo the same procedure. But as far as barely invasive operations go, can you blame these guys for trying? Especially when the other procedure that tries to stimulate the same growth -- microfracture surgery -- requires a surgically inspired bone break and far more rehabilitation time? 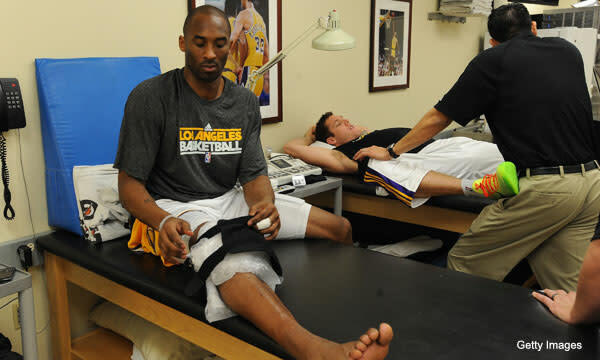 For Kobe, it's hardly a last chance, as he's never had to deal with any sort of major ligament and/or cartilage tear. His knee fatigue stems solely from playing more minutes (regular season plus playoffs) than anyone else, by far, from his generation over the last 15 years. And the attempt is well worth it because Bryant has clearly not been himself for the last two seasons, and any little bit helps. Even if it means moving platelets around. Gross, Kobe. Gross.